Laptop reviews tend to imagine a product that will probably never exist. Read enough laptop reviews on PCWorld and other sites, and you might notice a pattern: This laptop was almost perfect. If not for one major problem, it would have been nearly flawless. My PCWorld colleague Hayden Dingman called the Razer Blade Stealth “near-perfection,” if not for subpar battery life and a couple of smaller complaints. Whether it’s a weak battery, a low-resolution screen, an uncomfortable keyboard, or another failing, laptops can’t ever quite tick all the boxes. But how much of that fault lies with laptops themselves? Certainly, reviewers (and consumers) should evaluate products with a critical eye. But perhaps we’re misusing the idea of perfection, setting unrealistic expectations about what’s actually possible. Let’s look at the major categories of imperfection and see what’s legitimate—and what’s subjective, or even a stretch. In some cases, a laptop falls short of perfection because the manufacturer legitimately messed something up. Examples might include the constant, mechanical clicking noise in HP’s Pavilion 13-b102TU (NDTV: “One Flaw Keeps it from Being Perfect”) or click detection and trackpad lag issues in HP’s Spectre x360 (Mashable: “An almost perfect Windows 8.1 convertible”). 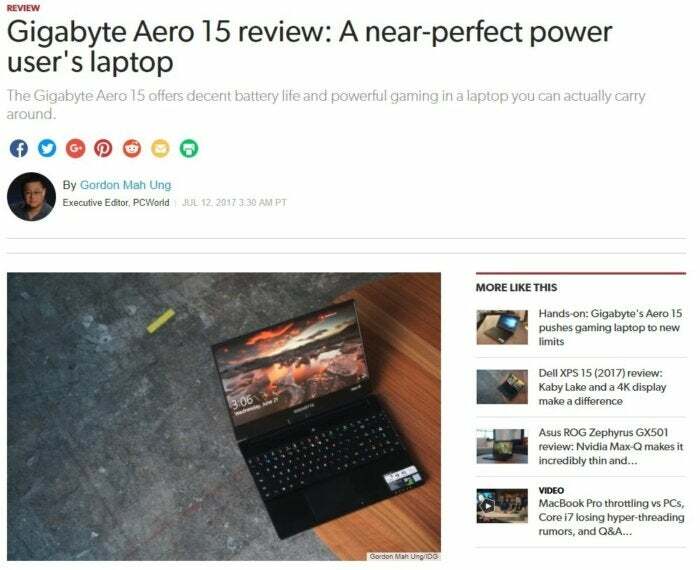 Last year, PCWorld’s own Gordon Mah Ung encountered this kind of brush with greatness while reviewing Gigabyte’s Aero 15 (“A near-perfect power user’s laptop”), which struggled with extended keyboard combinations and emanated an “odd harmonic, almost Kazoo-like sound” at maximum GPU loads. The common thread with all these reviews is that the laptop maker failed to achieve its own goals for the product, from tolerable noise levels to broader potential software applications. 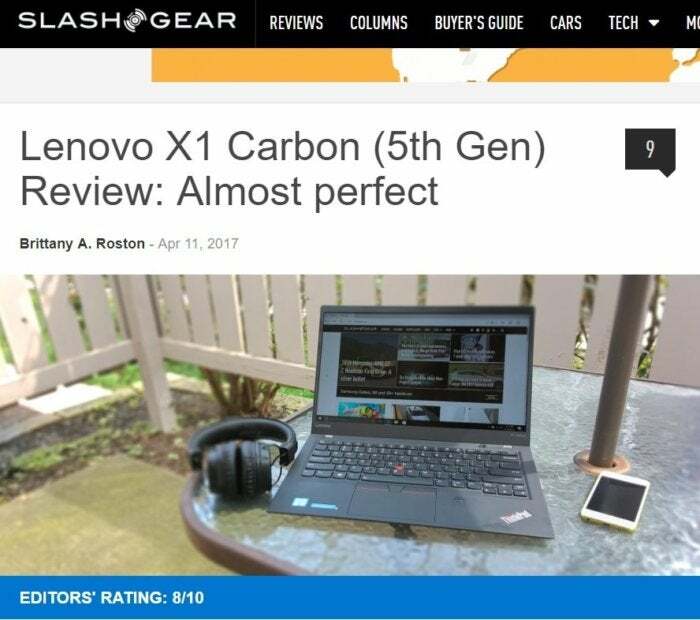 Laptop reviews shouldn’t just evaluate what’s in the box. They should also look for omissions, especially compared to other products in the same category and price range. But in doing so, they doom a greater number of laptops to imperfect verdicts. Should every high-end laptop, for instance, have a full-sized SD card slot? Slashgear’s Brittany Roston thought so when she reviewed the “almost perfect” Lenovo X1 Carbon last year. Should laptops use HDMI instead of Thunderbolt for video output? 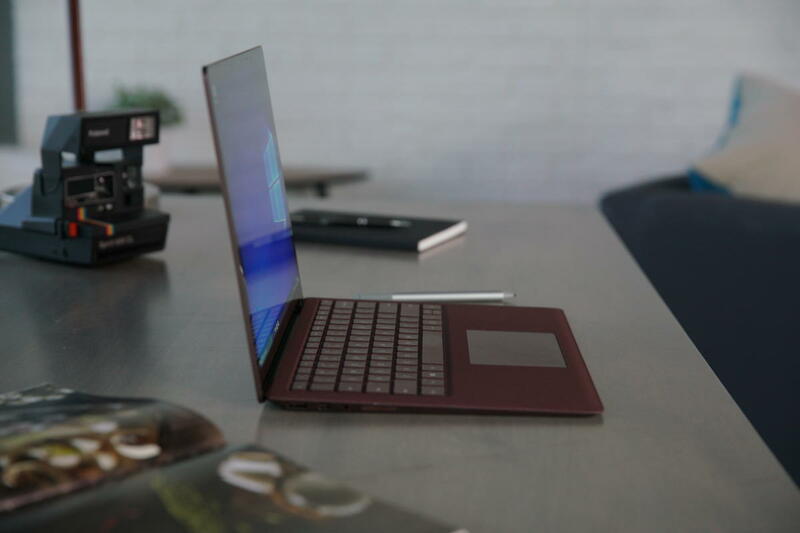 The answer is yes, according to Networkworld’s Bryan Lunduke, who decried the latter as a “mostly useless hole” in his review of the “nearly perfect” Dell XPS 13 Developers Edition. Some near-perfect laptops straddle the line between technical failures and missing features. Let’s call them Skimpers, which are notable for having a single component that’s markedly worse than the others. Tinny speakers are a classic culprit, as laptop makers often sacrifice sound quality to achieve thinner designs. The Asus U36S was a particularly egregious case according to PCWorld’s Sarah Jacobsson Purewal (“An Almost Perfect Ultraportable”), with speakers that sounded like “listening to a TV that’s in your neighbor’s garage.” Windows Central lodged a similar complaint against this year’s Lenovo ThinkPad X1 Carbon, which would have been “a perfect laptop” had it used better speakers and a more reliable fingerprint reader. Another sure way to fall short of laptop perfection is to skimp on the screen, be it with low resolution, high reflectiveness, or intolerable viewing angles. Tech Advisor’s Andrew Williams encountered the latter in 2017 while reviewing the Dell Inspiron 15 7000 , which he said was a great all-around performer. 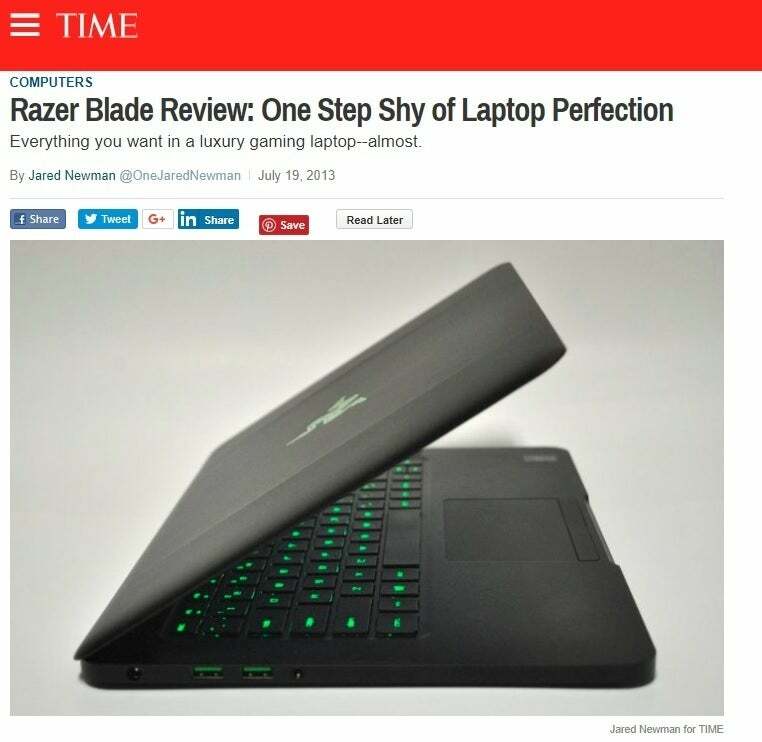 “It’s just a shame,” he said, “about the screen’s viewing angles and colours.” Even I’ve rendered an “almost perfect” laptop verdict on this count, calling atrocious viewing angles on the Razer Blade in a 2013 TIME.com review (“one step shy of laptop perfection”). Such foibles are possible on the software side as well. Last year, TIME’s Lisa Eadicicco found just “One (Fixable) Flaw” with Microsoft’s Surface Laptop: Instead of shipping with regular old Windows 10, it came with the watered-down Windows 10 S. Had Microsoft just given people the full-blown Windows experience they actually want, perhaps the company would have achieved laptop perfection on its first try. What happens when a laptop gets perfect marks in performance, features, style, and software? Chances are it costs too much. 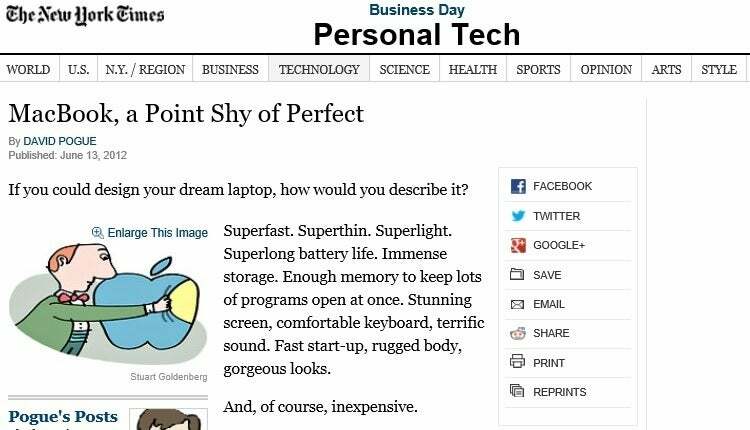 Pogue’s review underscores the Sisyphean situation in which we’ve put our laptops. Although every tech product involves some compromise, we feel it most acutely with PCs, which come in endless shapes and sizes, must work with countless accessories and input methods, and have to accommodate a wide range of potential workloads. The perfect laptop must do all this...and be a bargain? Given these stringent conditions, there are just too many opportunities to get things wrong. None of which means that reviewers, observers, and consumers should start pulling punches. But instead of setting the bar at perfection, and counting all the ways that our laptops didn’t get there, we should instead recognize that they never had a chance to begin with.